To provide a rich customer experience, websites and mobile solutions increasingly depend on third-party technology/components. Web services enables technology integration and bridges decoupled systems across various platforms and applications. As a result these integrations introduce a new level of complexity and challenges. The increase of communication paths and the complexity of composing such services compounds the task of testing and monitoring the health and performance of your systems. With no application graphical user interface, testing and monitoring the performance of your web services without the right tools is a challenge. Commercial API testing tools generally support the creation and verification of tests, however lack real-time performance monitoring and trending capabilities. TestPoint has developed a simple and powerful SoapUI Extension to its VSAM platform which enables real-time performance monitoring and trending capability of your web services both within and outside your network. 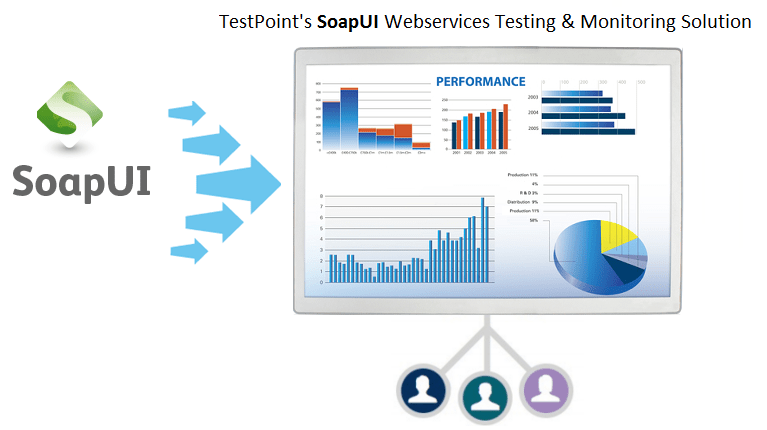 TestPoint’s VSAM SoapUI Extension delivers real-time visibility of your web services performance early within your build/development phase through to production monitoring. VSAM allows organisation to proactively identify and monitor problems before real users are impacted to expedite problem resolution, reducing the business impact and cost of web services defects. VSAM SoapUI Extension ensures you meet your business requirements providing advance performance monitoring and clear KPI dashboards. The extension compliments your existing SoapUI or SoapUI Pro investment, enabling a centralised performance and synthetic monitoring solution without having to change your tool or redevelop existing scripts. With little effort you can extend SoapUI into a complete end to end solution across any environment, build or location centralising performance metrics, functional test results and meaningful responses in real-time using your TestPoint VSAM cloud dashboard.